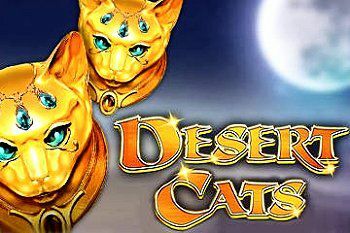 The Desert Cats slot from WMS Williams has 7 reels and many different bonus games. Play Desert Cats and you will be captivated with a mystical aesthetic inspired by Ancient Egypt. Wild Golden Cats with jeweled eyes on the reels can lead to riches, awarding one of five progressive jackpots! The game also boasts an enthralling Free Games Bonus that awards 15 Free Games. During the Free Games, four of the seven reels are covered in Wild Golden Cat symbols for a chance at huge wins! WILD is wild for all symbols except for scatter symbols. LION is a scatter symbol and is present on all reels. During the base game, 2 adjacent reels will be replaced by reels consisting of WILD symbols. WILD symbols may contain red gems in the base game. Land 6 or more red gems to be awarded Jackpots. Jackpots are shown above the reels and are only available in the base game.